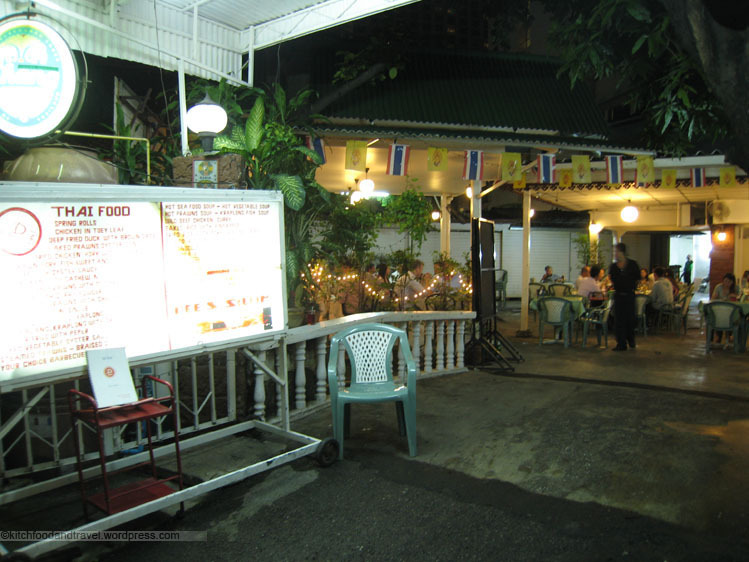 While randomly looking for a place to eat Thai food in the Silom area of Bangkok, we came across this outdoor covered restaurant on one of the side streets. The restaurant actually did have an indoor section, but it seated only maybe 12 people, whereas the bulk of the tables were outside. I have eaten here several times now, and overall, I do prefer sitting outside for the nice atmosphere and lack of al fresco dining in Hong Kong. 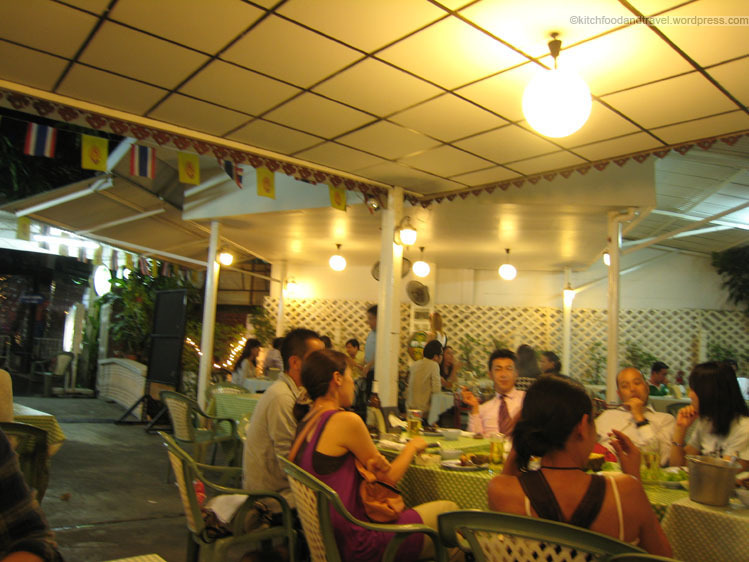 Outdoor seating, quite full at night! 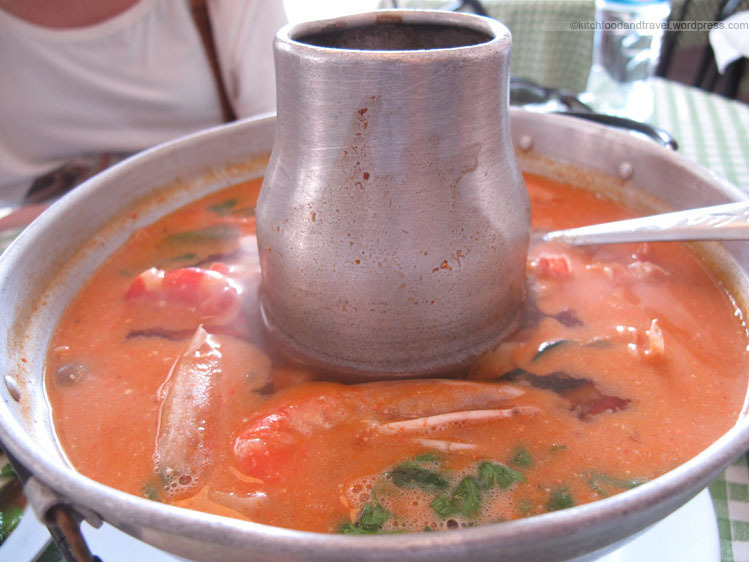 Tom Yum Goong – In many places in Thailand, I have found the level of spicyness for Tom Yum to be insufficient. I suspect that the chef is trying accomodate for the tourists who aren’t necessarily accustomed to spicy food. 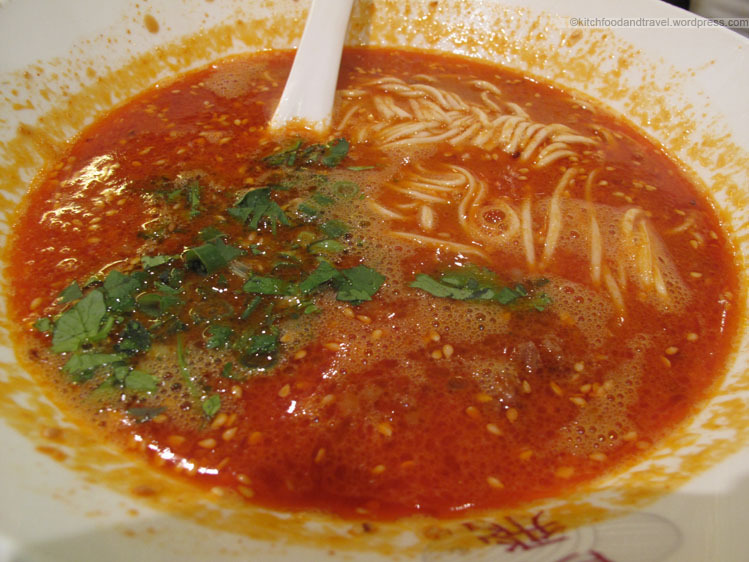 Me who loves spicy food however, has been disappointed with those places as Tom Yum is supposed to be spicy! 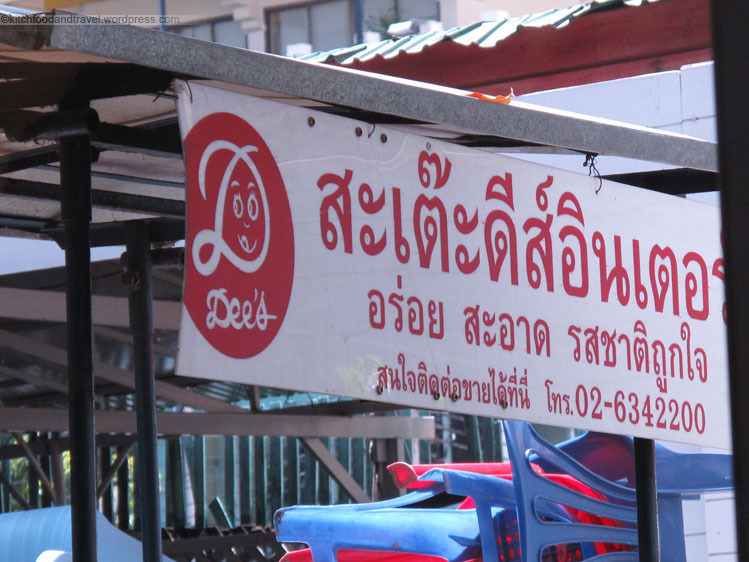 Luckily, at Dee’s, the soup was made spicy and quite tasty. 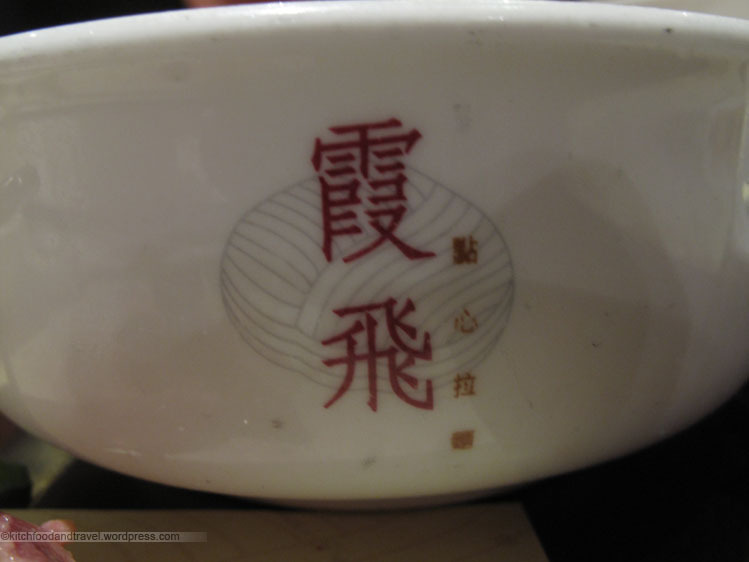 The shrimp however was overcooked probably due to the soup continually being heated at the table. 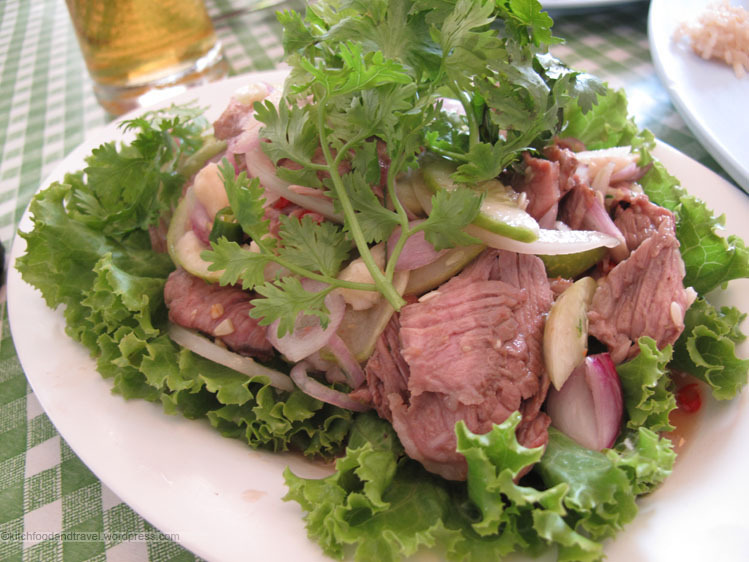 Thai Beef Salad – Very refreshing with the standard Thai flavours of lime, shallots, chlli, cucumber, garlic, nuts and coriander. The dish overall was spicier than expected but the combination of its chilled salad mixed with warm beef, the sourness and excitement of the lime and the kick of the chilli was excellent and wakes you up. Grilled Mussels – Originally wanted grilled cockles but they ran out. 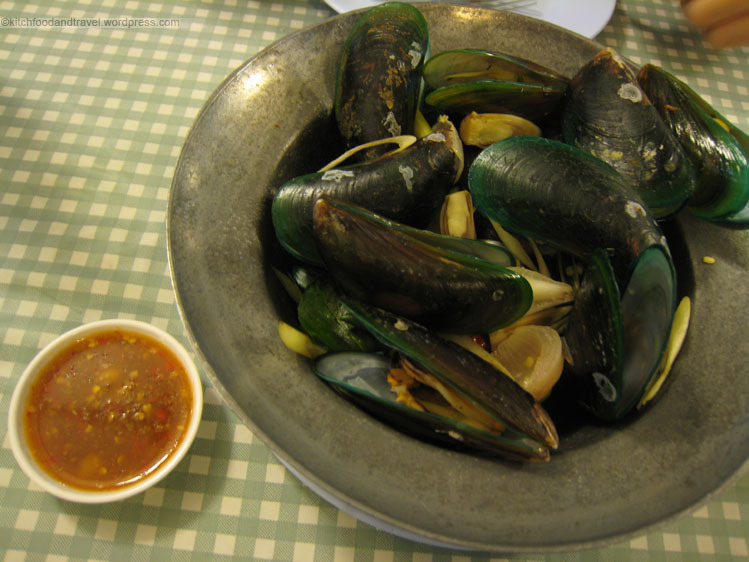 In any case, the grilled mussels with lemongrass and basil were juicy and went well with the chilli sauce that was provided. 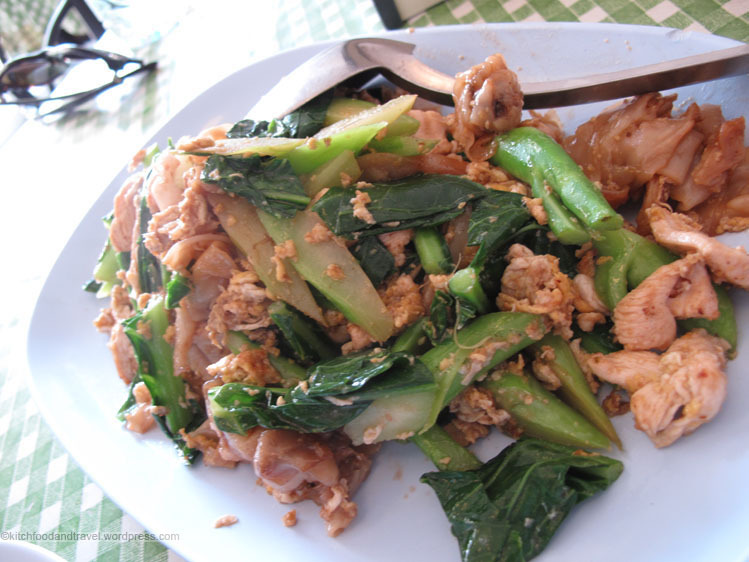 Pad See Ew – This Pad See Ew came with chicken. It was a bit more oily than I would have preferred but taste wise, it was nice. 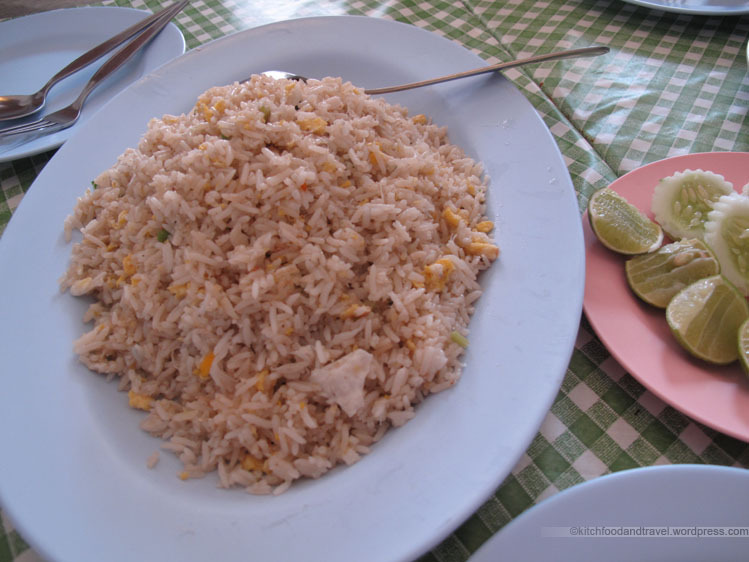 Crabmeat Fried Rice – I will never forget the crabmeat fried rice I had in a local restaurant in Pattaya. In that particular restaurant, the amount of crabmeat was just ridiculous as there was more crab than egg or anything else for that matter. Unfortunately I do not know the name, just that it was on Pattaya Sai Song on the left hand side and a walkable distance coming from the Dusit Thani Pattaya Resort. I also do not know if its still around. Anyway, since that wonderful meal, I have been on the lookout for a comparable crabmeat fried rice. Although the one at Dee’s did not have nearly as much crabmeat, it was still nice with the lime and chilli fish sauce and went eaten with cucumber, it perked up. 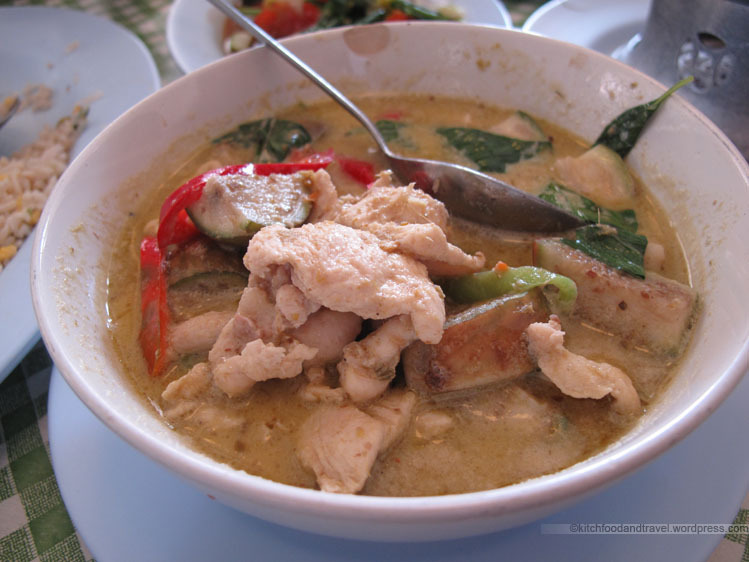 Thai Green Curry with Chicken – The green curry itself was a bit watery, but this seems to be the case with much of the green curry I’ve tried in Thailand. It was good to have with rice and there was a generous amount of chicken given. Still would have preferred to have a thicker sauce though. Overall, the meal was very very decently priced and easily worth another try. In addition, the ability to just chill and eat outdoors appeals to me alot! 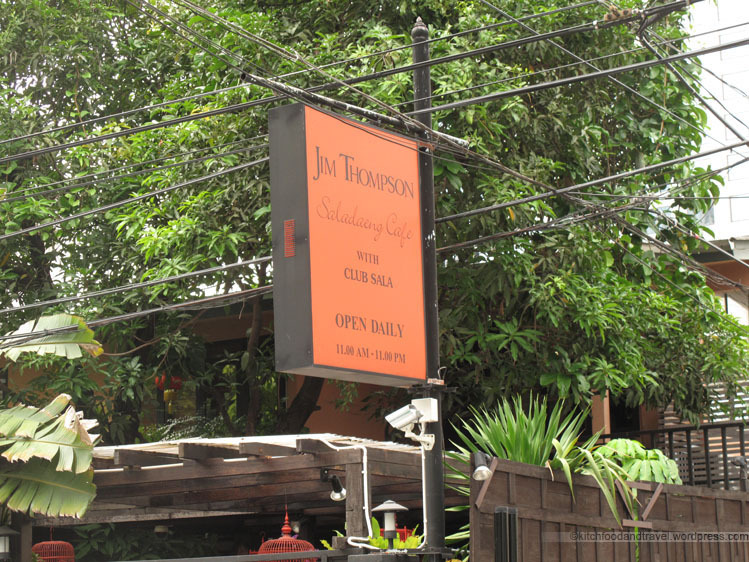 Actually, we were trying to find another place called Cafe 9 also related with Jim Thompson that was recommended to us by the concierge, but as we were weaving our way through the streets of Silom, we saw another Jim Thompson and just assumed that it was the cafe that we were looking for. 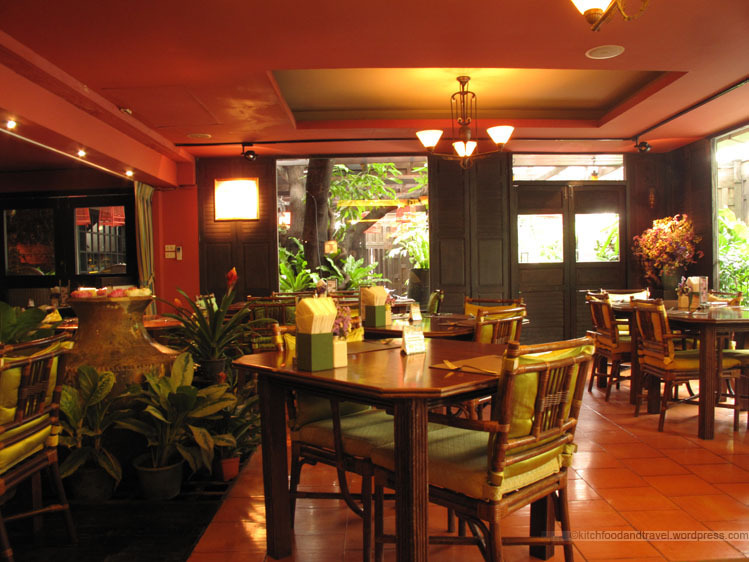 It was only after we had sat down and ordered 10 minutes in, that we asked someone, and realised that we were in the wrong Jim Thompson. 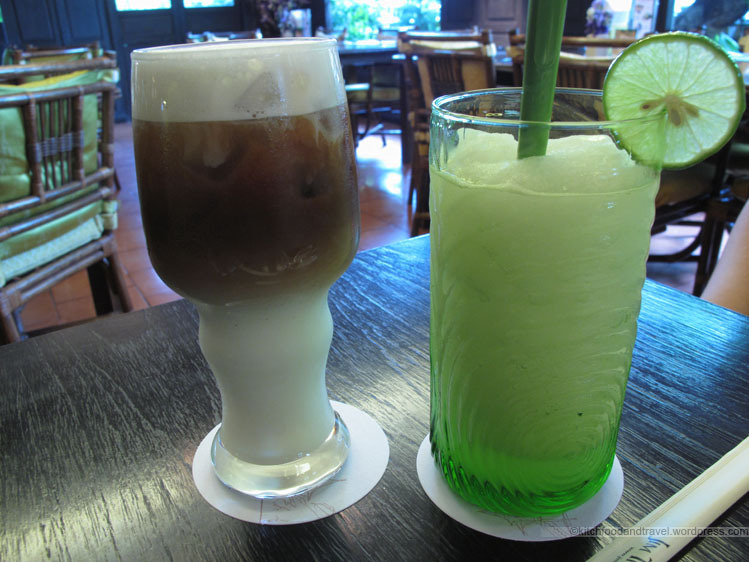 In the end, it all worked out for the better because there was actually alot more choices available at the Saladaeng Cafe than at Cafe 9 and the environment also seemed a lot better. 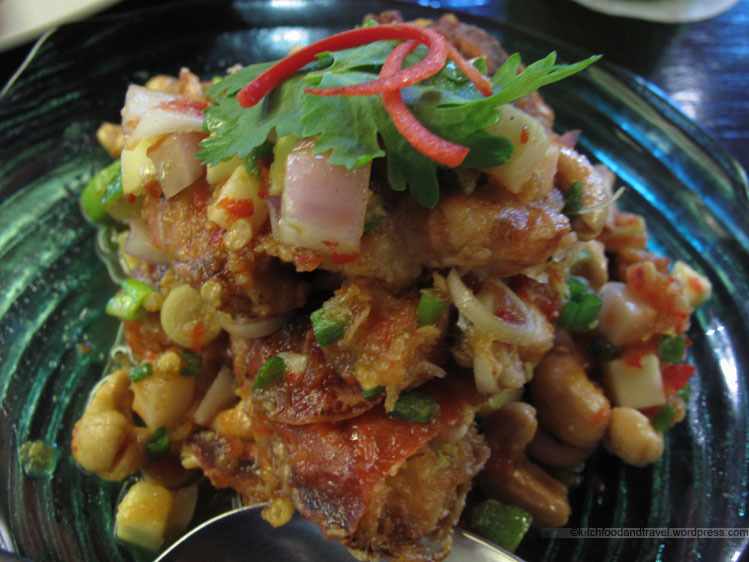 Soft Shell Crab Salad with Herbs – A refreshing salad due to the mix of sweet, sour and spicy. The soft shell crab has a slight crunch and was very tasty. The salad also has the classic Thai combination of lime, green mango, cashews/nuts and shallots among other things. 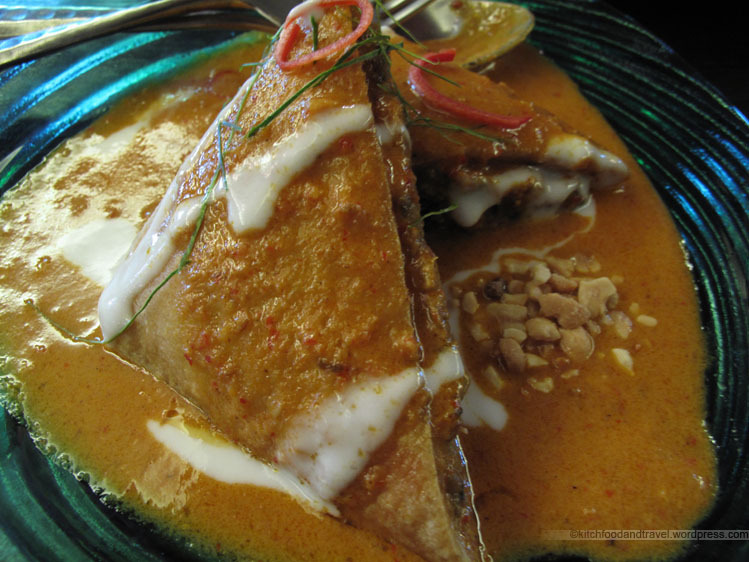 Creamy Panang Curry (crushed peanuts . coconut cream . tofu . 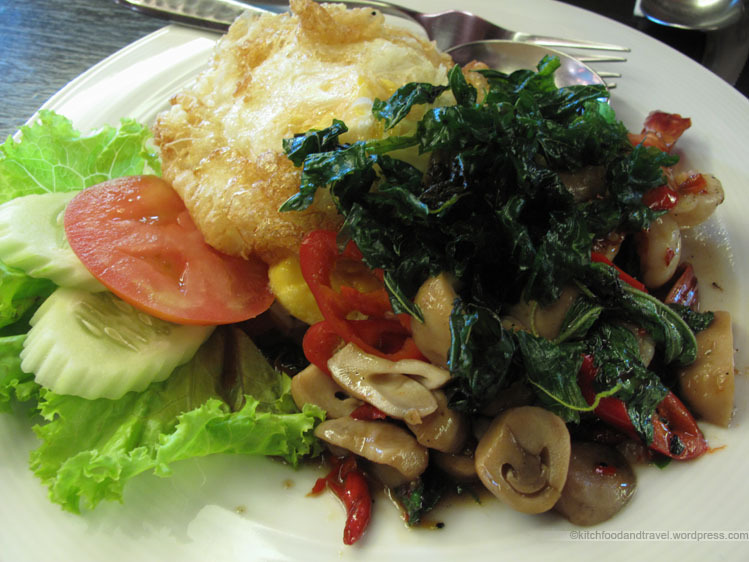 mushroom) – I gotta say that overall, this was an unexpected weird yet interesting dish. I can only describe it as a tofu waffle with a mushroom like patty inside? The curry sauce though was very nice and there was a slight spice to it. Khao Phad Gra Prow Goong – A mix of fragrant Jasmine rice with stir-fried prawns, garlic, bird’s eye chilies, holy basil and served with fried egg. The sauce was very tasty and the prawns were a good size as well as being juicy. The egg on anything is good, but my one gripe would be that the egg was not runny enough as it was slightly overcooked. The fried basil though was a nice touch for extra flavours. There are actually two Hunan Garden’s in Hong Kong. One in Central (Exchange Square) and the other in Causeway Bay (Times Square). The one in Central is decorated in a more Chinese fashion, but perhaps a bit dated. 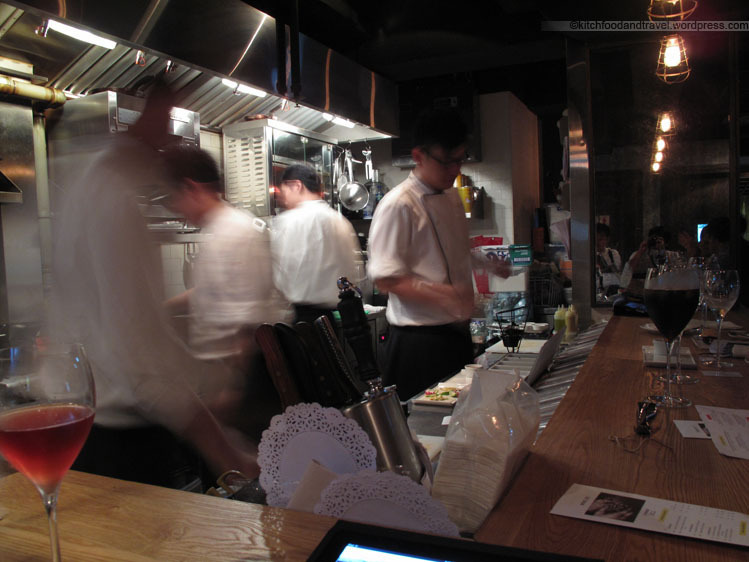 The one in Causeway Bay is newer and looks like a modern high end restaurant. 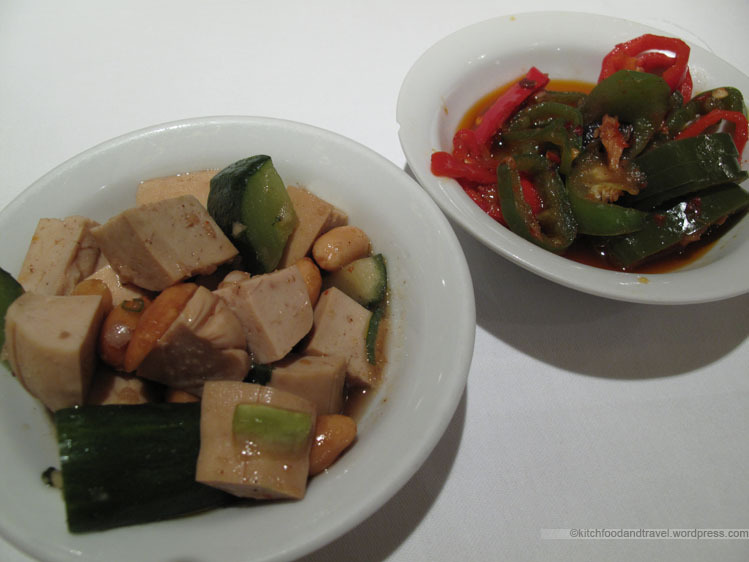 Hunan Garden is normally quite expensive, but if you go to the one in Times Square for lunch from Monday to Saturday, you can get 50% off the a la carte menu (excluding certain items and dim sum). But overall, this deal is still great as there are many tasty dishes that you can still order while applying the 50% discount. The appetisers of tofu/cucumber and chilli were good and I would recommend eating them together if you aren’t fussy about spiciness. 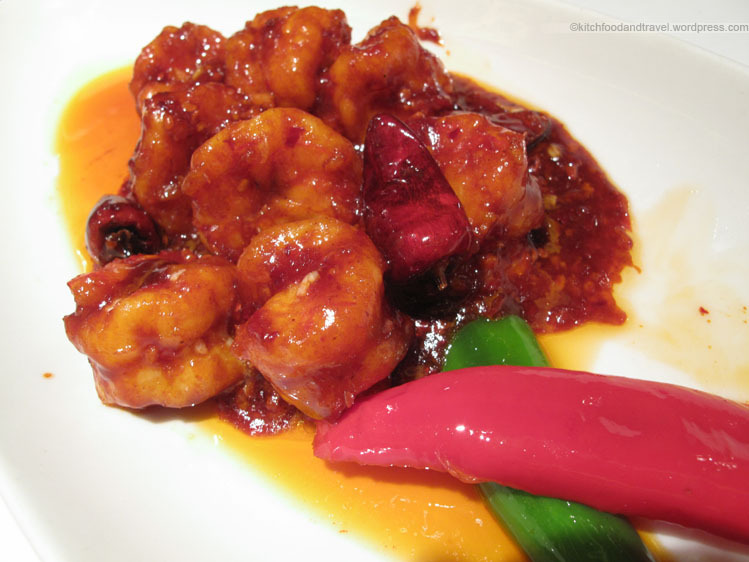 Hunan Deep-fried Prawns in Chilli Sauce (湖南左宗棠蝦) – The prawns were smaller than I expected, but they were fresh and nice and juicy. The chilli sauce that surrounds it is reasonably spicy but I suggest using only a little in order not to overpower the natural prawn taste. 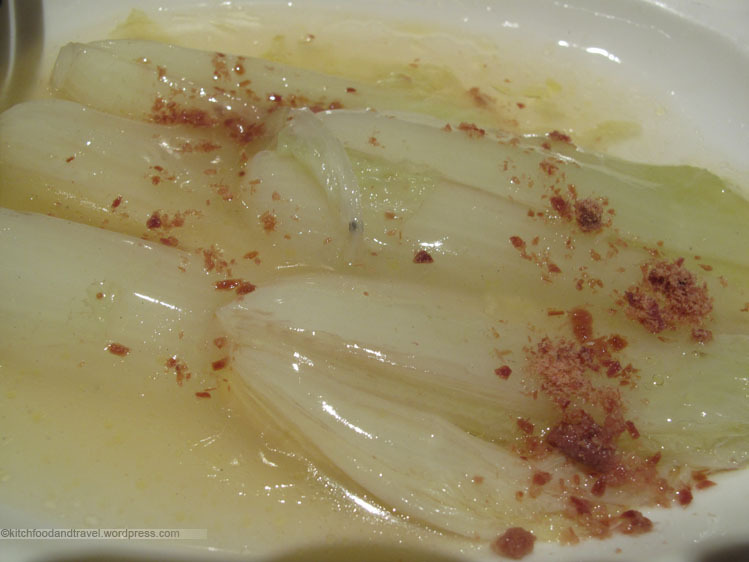 Stewed Tientsin Cabbage with Minced Ham (金華腿茸扒津膽) – The vegetables were nice and refreshing with the other dishes all being spicy. I thought that it was a little bland but this could simply be down to the other dishes being spicy. 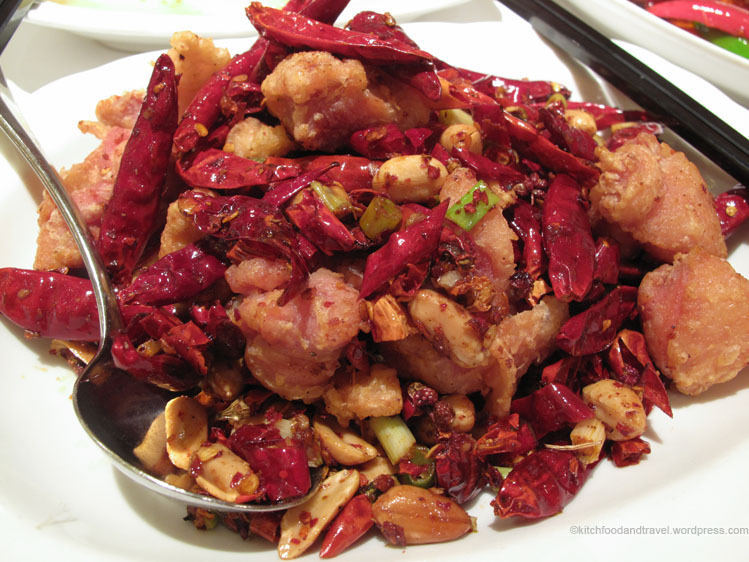 Fried Chicken with Dried Chilli (小鄉里霸王辣子雞) – Despite the chicken looking dry, it is cooked really well and is extremely succulent and juicy. The chilli’s and peanuts complemented the chicken well, but for all the chilli the dish appears to have, I wouldn’t mind it being even more spicy (but that’s just some minor details). This place was recommended by a friend and so we decided to drop by and give it a try for another friend’s birthday. The place was pretty much full when we got there around 6:30pm and so there really wasn’t much choice and we were seated at the very back on the bar table facing the open kitchen. Actually, this was my preferred choice since I love watching chefs cook and in any case, in the end, this was to our benefit as we noticed and got to try the staff special (see below). 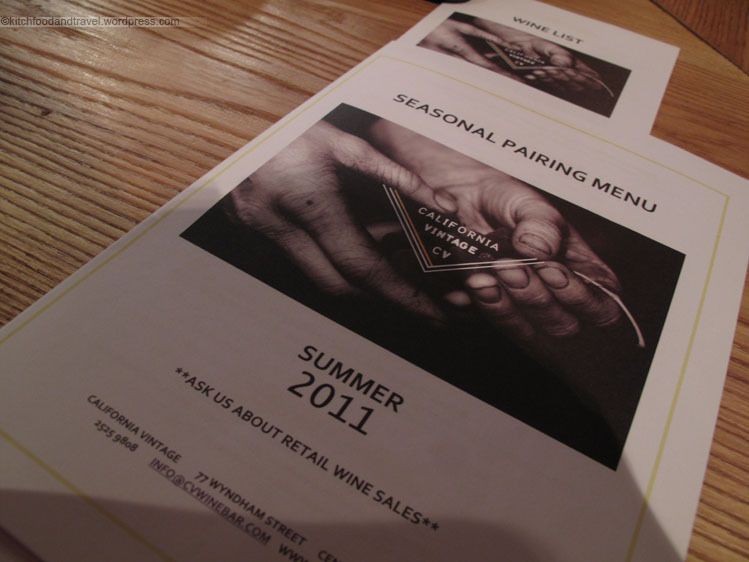 They offer two types of menus, the normal paper ones, and then the more technological advanced iPad version. 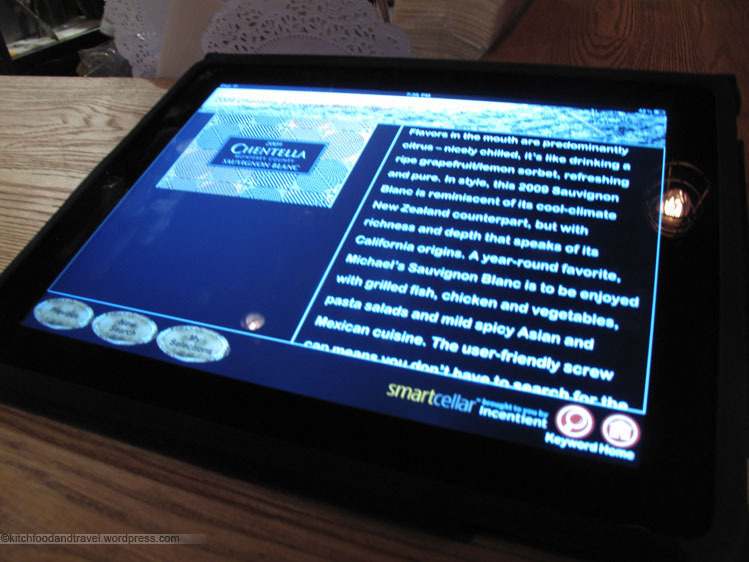 All that is missing now is being able to order straight from the iPad, in which case you can then hire less people. I was a little disappointed with their beer selection with Anchor Steam being the only choice. California is supposed to have quite a few really good micro-breweries and I would certainly love to try them in Hong Kong. The other thing is that I can get Anchor Steam at Inn Side Out and their related restaurants at a cheaper price so I would not order it here. On the other hand, their wine selection is pretty good and the pricing appears to be quite competitive for a restaurant especially if you order by the bottle. 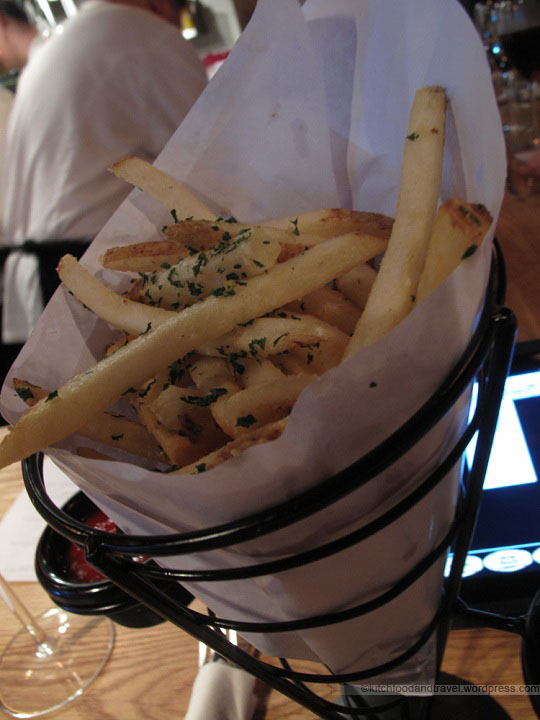 Gilroy Garlic Fries – The fries were not too garlicky and rather than just being cooked outside the fries, I think that the garlic was actually infused into the potatoes. In any case, it tasted great and you are given a choice of whether to use ketchup or truffle aioli as a dip. 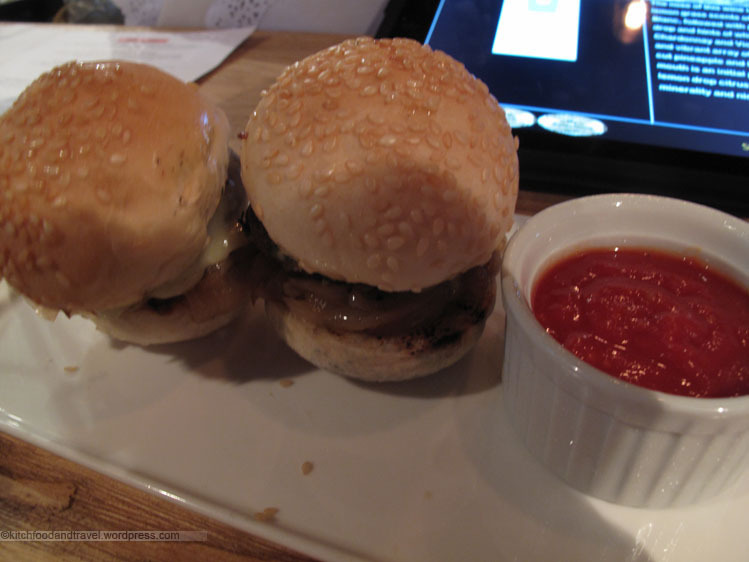 California Sliders with Angus Beef Burger and Bravo Farms Cheddar Cheese – The sliders were excellent. The beef was cooked medium and extremely juicy when you bite into them. The buns were hot toasted and crispy and slowly soaked up the juices from the beef and the caramelized onions. My one gripe is that for two sliders, it was pretty expensive considering the two sliders put together did not make a normal sized burger. 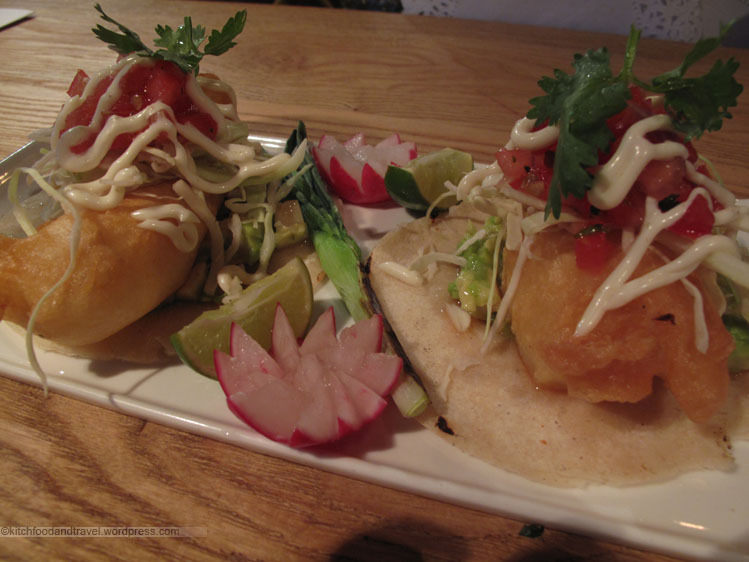 California Tacos with Baja Fish – This is Baja fish batter-fried, served on a soft corn tortilla topped with shredded cabbage, pico de gallo (aka salsa fresca) and cumin-enriched sour cream. This is not your standard taco as you can hardly use your hands to lift it up. The only way to eat it is to cut using your knife and fork watching as it slowly falls apart before piecing it back together again on your fork. Still, the fish was nicely cooked with its slight batter crunch and matched with the tortilla, cabbage, salsa and sour cream. 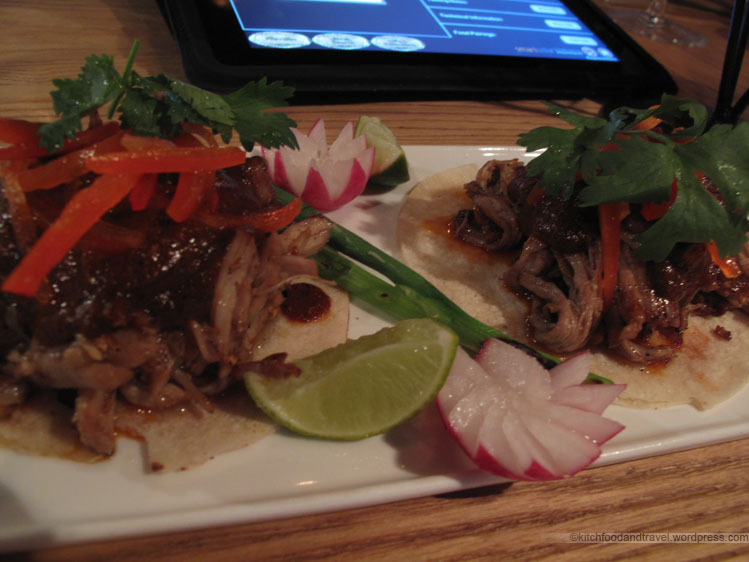 California Tacos with Carnitas and Salsa Roja – Essentially shredded pork shoulder served on a corn tortilla with house made salsa and Guaillo chilies. Unfortunately the pork shoulder seemed a bit dry and tough. The chilies added a bit of spice, but I don’t mind if there was more whereas the tortilla and house made salsa was nice. Again, its not really your standard tortilla and definitely required a knife and fork to eat. 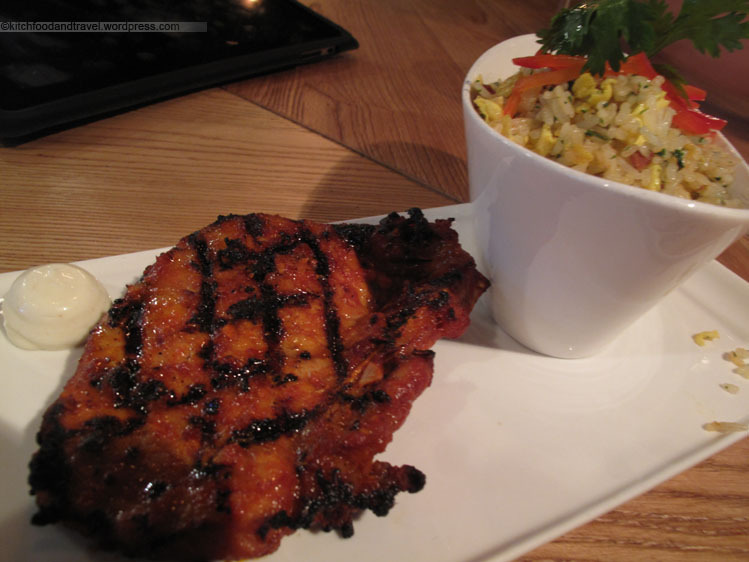 The Staff Special (Grilled Pork with Fried Rice [off the menu]) – We had finished our meal and were just sitting around, sipping our second bottle of wine, when the staff took turns coming by the bar table to have their own dinner. The chef cooked up what was essentially grilled pork and fried rice but it smelt amazing. It was our friend’s birthday and after being deflected through a few different channels, the chef did finally cook up the special for us. The pork was tender and juicy with a nice char-grilled flavour. The fried rice was cooked with eggs and chives and a mystery sauce. Very simple, yet very tasty as well. I enjoyed myself at this restaurant. The food was great, but perhaps a bit expensive for the portion size. The wine on the other hand is a good deal and I would love to try a few others. The next time I eat here, I would continue to sit at the bar table despite not being able to face each other, as the tables in the main area does seem a bit small and cramped. The only thing that stops me from putting this restaurant in the highly recommended category is perhaps the price. I would recommend making a reservation for this place. We called ahead and tried to make a reservation ourselves, but they said that the reservations were full for that night. They suggested we just walkup instead since they have some seats just for those who walkup. We got there quite early around 6:15pm but the tables inside were already full and we had to wait a bit. Luckily, there wasn’t too many others waiting and it took only about 10 minutes to get a table. By the time we left though, there was a lot more people gathered outside waiting for a table! 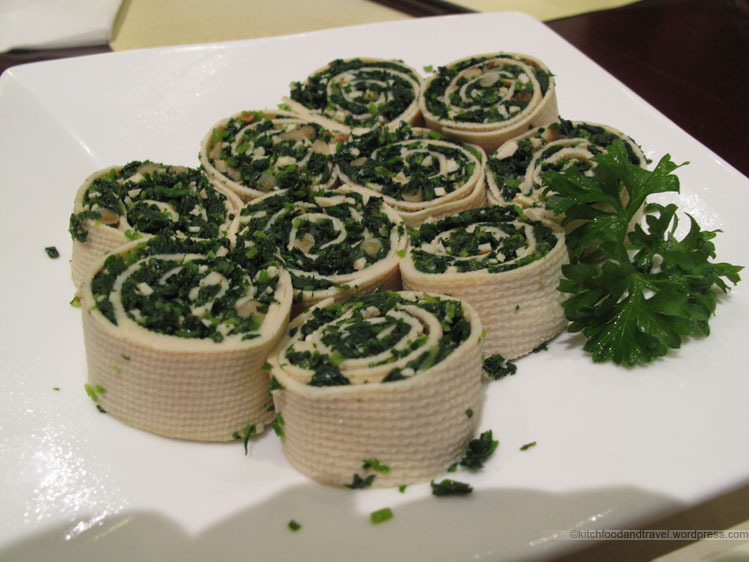 Wild Vegetable and Diced Bean Curd in Sauce (馬蘭頭百葉卷) – The rolls were smaller than I expected but tasted nice with vinegar. The vegetables have a grassy earthy taste which I like, but may not be for everyone. This dish was the only one that I felt was a bit overpriced though. 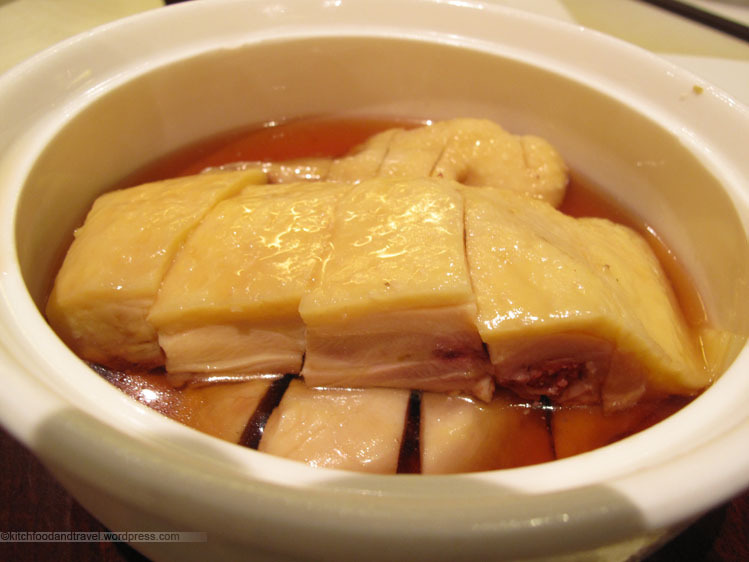 Chinese Yellow Wine Marinated Chicken (醉雞) – Normally I’m not a big fan of this dish, but this was done pretty well. The alcohol did not over power the chicken flavour and the chicken was not too fatty. 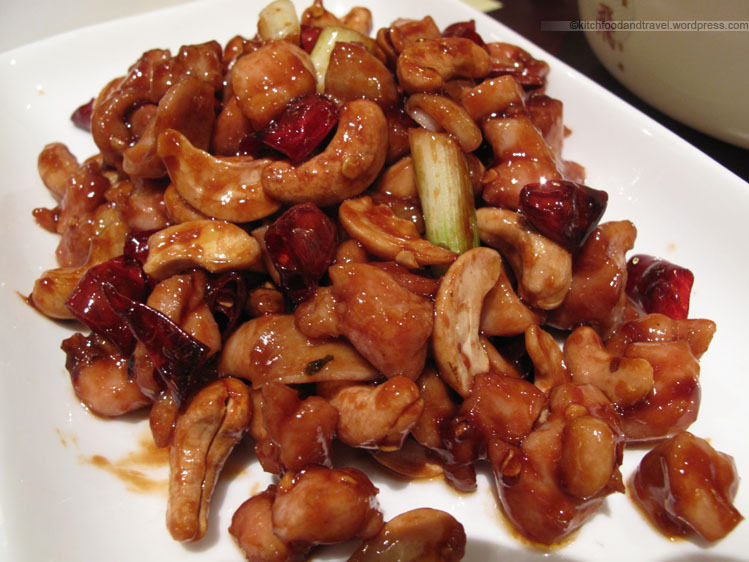 Fried Diced Chicken with Cashew Nuts & Chili (官保雞丁) – The chicken was soft and juicy and tasted excellent. There was also a suprinsingly good amount of cashews given. The only thing I can add is that it needs to be more spicy though. Not enough chilis for a dish of this kind! 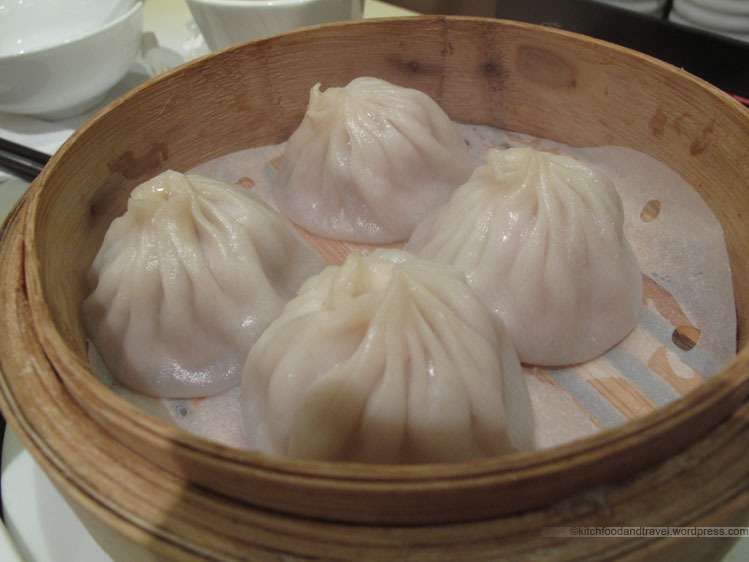 Steamed Minced Pork Dumpling (鲜肉小龍包) – The skin was not too thick and the soup and meat were nice and hot as you bit into it. Very nice! 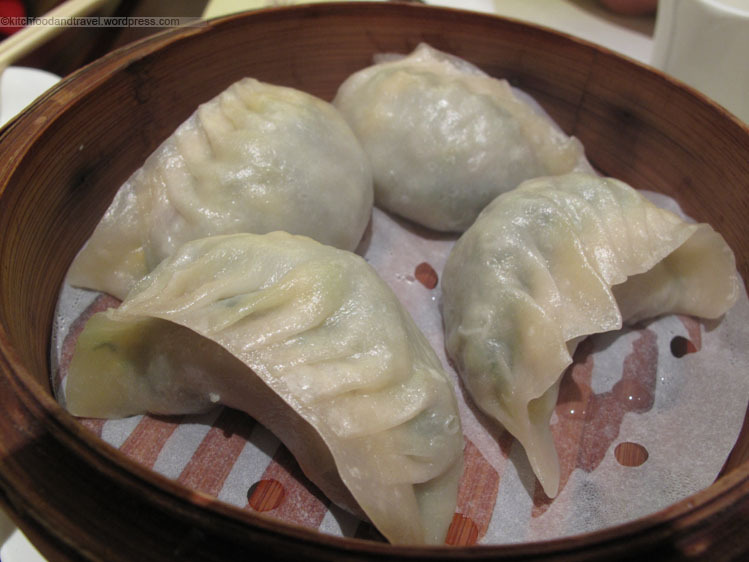 Steamed Vegetable Dumpling (花素蒸餃) – Generally, I love the vegetable dumplings alot and would order them in any restaurant that I see them in. While the ones served here were not the best I’ve tried, they were still very good and worth a try. Great with lots of vinegar! 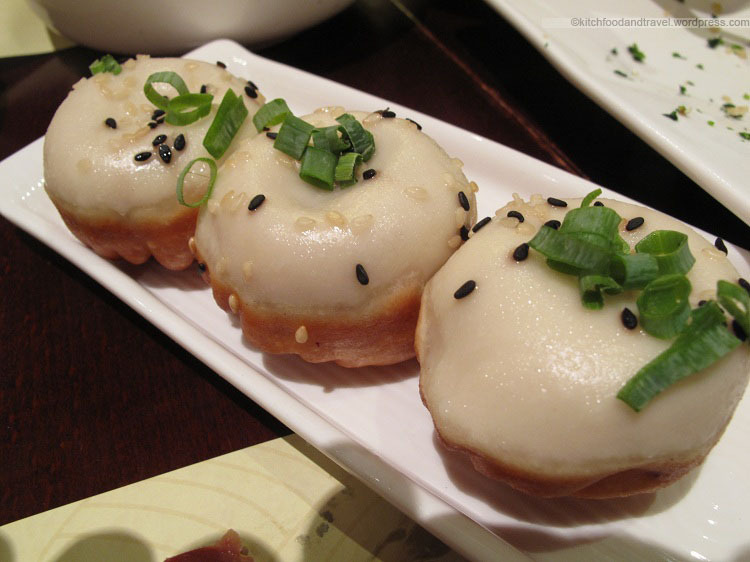 Pan-dried Minced Pork Bun (鲜肉生煎饅頭) – The bun was crunchy, yet the meat inside was still nice and juicy. The bun itself was also sweetish and went well with the seasame that covered it.